AL. 2pp. Hawarden Castle, Chester. October 10th no year [but 1863]. No address [but to the Wedgewood Institute and Memorial Committee]. Together with a fine contemporary portrait photograph. 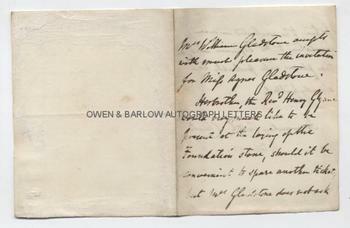 "Mrs William Gladstone accepts with much pleasure the invitation for Miss Agnes Gladstone. Her brother, the Rev.d Henry Gladstone would very much like to be present at the laying of the Foundation Stone, should it be convenient to spare another ticket, but Mrs Gladstone does not ask for him to be included in an invitation to the Dejeuner also, as the places will probably be already filled." 16mo. Approx 4.5 x 3.5 inches. Slight mounting traces on verso, else fine. 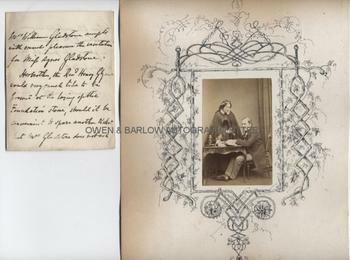 The photograph is a 19th century albumin photograph of carte de visite size (approx 3.5 x 2.5 excluding mount) mounted on card from an album leaf with a border of fine original penwork. 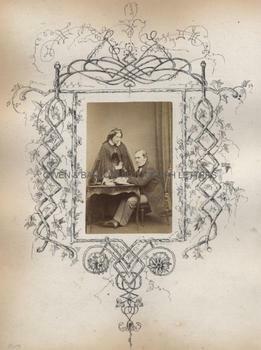 It shows Catherine Gladstone full-length, standing, with her husband, W. E. Gladstone seated at a writing desk. There is mounting damage to the verso of the mount but the photograph is in fine condition. Both the LETTER and the photograph are from a 19th century collection made by the radical Liberal M.P., William Woodall. Woodall was Surveyor-General of the Ordnance and Financial Secretary to the War Office in two of Gladstone's administrations. He was also a Trustee of the Wedgewood Institute. The laying of the foundation stone of the Wedgewood Institute, Burslem, took place on 26th November 1863. William Gladstone was one of the honoured guests and an address to him was made by the Committee. His wife, Catherine Gladstone and daughter, Agnes, were also invited but, clearly, Mrs. Gladstone was anxious that her son, Henry, should also attend. 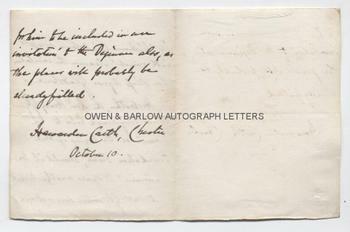 Catherine Gladstone was a great beauty in her youth and the daughter of Sir Stephen Glynne, 8th Baronet of Hawarden Castle. It was in her ancestral home that the Gladstone's lived after their marriage. Unlike Gladstone, she was untidy and disorganised in her personal life but possessed of a shrewd intelligence and keen desire to do good work. She was the founder of numerous orphanages and homes for the sick and convalescing.